4th International Conference on 'Computing, Communication and Sensor Network', date: 24-25th December, 2015, in Kolkata, India. 24th & 25th December, Kolkata, India. ( we have a record of publishing about 95% accepted and registered papers in different online Journals). Free accommodation in hotel/hostel for maximum of two nights will be provided for registered student authors. Micro2015: (one of our past Conference:) Guests in Inaugural Sessions: from right: Prof.Vijay Nath, Prof.C Sarkar, Prof.JKMandal, Prof.P Neelakanta, Prof.Dulal Acharjee, Prof.SPMaity and Prof.Sanghamitra Brahmadatta. Registration fee for other countries = $250(USD) for one delegate. N.B. organizing committee has rights to change/edit/cancel any options of the conference as declared. Once paid, registration fee is not refundable. Micro2015 conference: Mr.Raghvendra Saxena, Scientist-E, DRDO, Delhi, is receiving his best paper award from Prof.P Neelakantaswamy of Florida Atlantic University, USA, beside Prof.Dulal Acharjee, General Chair, Micro2015. Micro2015 conference: Mr.Subir Ku.Maity, of KIIT University, Bhubaneswar, Orissa, is receiving his 2nd best paper award from Prof.P Neelakantaswamy of Florida Atlantic University, USA, beside is Prof.Dulal Acharjee, General Chair, Micro2015. Bank Address: Subhadra Market, 1st Floor, Rourkela-769001, Orissa, India. We are going to organize workshop on Wireless communication and programming using Simulator NS2/Linux. Registration Fee= Rs.3000/- per person. * We guide School/College Science Projects, help in theory/practical . 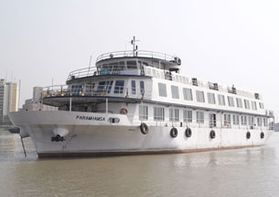 Full day program will be within Cruise Ship which will move within Ganga River of which one side is Kolkata and other side Howrah City . Micro2014: Guests in inaugural session at Hotel Hayatt Regency, Salt Lake, Kolkata, India. Micro2015 Conference: delegate in Valedictory session at Science City, Kolkata, India. Micro2015 Conference: delegates in opening session at Hotel Peerless INN, Kolkata, India. Micro2015 Conference: organizing committee members at Registration Desk at Hotel Peerless INN, Kolkata, India. How to publish to a Good Journal? 1. Make paper according to the paper template as mentioned. 2. Upload your paper to our paper uploading site. 8. Our Guest Editor of of journals will contact you that in which journal your paper is preliminary selected from us. of conference papers in different Journals for our past conferences.